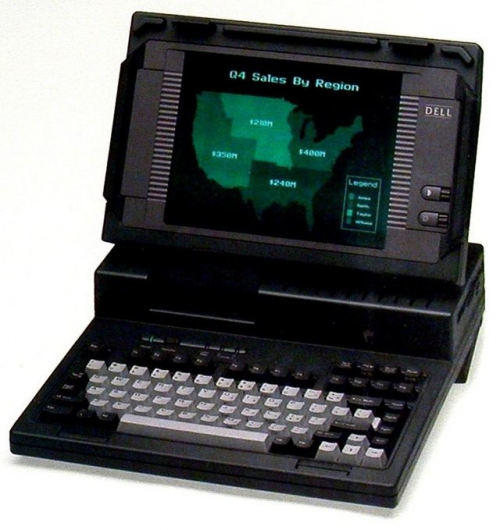 Dell sold its first laptop in 1989, and it still looks good today. For the past 30 years, Dell has made lots of laptops, notebooks, and tablets, so it’s learned a few things. Its also learned about user’s wants and needs. And, the company has stayed at the leading edge of technology. All of that is personified in the new Latitude 7390. As the image illustrates the screen has a gravity switch so the display is always correctly oriented. There are five versions of the 7390, varying by CPU and RAM. The SSD is the same (128 GB) starting size for all versions and can optionally increased to 512 GB. PCIe NVMe SSD is also supported. The 13.5-inch anti-glare anti-smudge Gorilla-glass protected touch screen’s resolution is 1920 × 1080 (165 ppi) with a narrow 0.46-in bezel. 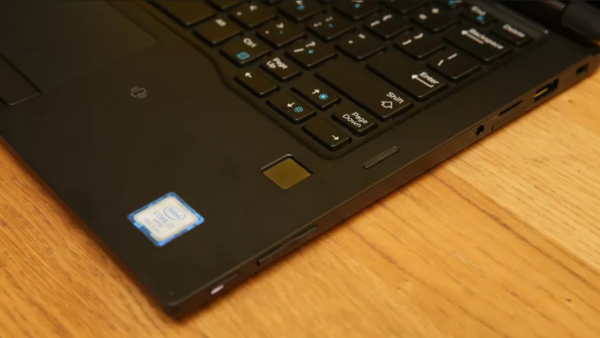 It’s a bright IPS screen that puts out 300 nits (average notebook is 200 nits). The active pen is an option. It is an always-connected PC and is equipped with a Qualcomm Snapdragon X7 LTE-A modem. Designed for content creation and display, the super hinge lets the screen be in stand-up tent position, clam-shell position, totally flat on table, or folded all the way around to be used as a tablet. In all those modes, the active pen can be used. The hinge is stiff enough that the unit can be put in a low-profile tent shape and used as drawing pad that is slightly elevated. The pen. 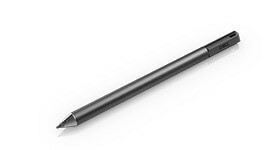 Dell, working with Waytec, has created a pen that is comfortable, pressure sensitive, and with a nub that gives close to the feeling of a ball-point pen on paper. The pen has a small magnet in it. The keyboard also has a magnet in left hand side of the case, so you can just stick it to the side of keyboard when not in use. The 20g (including batteries) pen is 6.33-inches (160.6 mm) long and has a 0.37-inch (9.5 mm) diameter. The battery will last for 12 months (assumes 3 hours/day, 5 days/week). The pen is pressure sensitive and can resolve 2,048 levels. Pressure sensitivity is often used for line-width, push down to make fat line, touch more lightly for a fine line. Security. There are three or four ways to log-in to the OS, traditional password, finger print, or visual. If you choose visual, and the computer doesn’t recognize you, you enter a PIN. The visual recognition IR Camera is optional. A smart card can also be used for additional verification. The camera uses Dell’s FastAccess 3.0 software, which is based on Windows 10 Hello software (Win 10 only). Designed for light-weight mobile use, the 7390 can be docked and use an external keyboard and mouse. The hub is a hockey-puck sized device that accepts a USB-c mini connector, and generates the correct signaling for HDMI, DP, VGA, Ethernet, USB-C, and USB-A. To round out your go-bag, Dell provides back-pack, and an optional batter-backup device. The 7390 can be powered from a Dell Hybrid Adapter + Power Bank | USB-C. The 7390 should be able to run for six to eight hours on the 45 wh battery. The 7390 will run up to 12 hours on its internal 60 wh battery. The Latitude is one of the most versatile machines we’ve seen. It’s highly portable, always connected, has an accurate pen and touch screen, and as many ports as you would get with a desktop. We ran a battery of tests on 7390, and its big brother a XPS 15 9575. We also compared it to some data we had on a HP Zbook. We ran PC Mark, and got the following results. This test group's workload reflects the demands of working with digital content and media. The tests include Photo Editing, Video Editing, and Rendering and Visualization. GeekBench scores showed similar results. The Surface pro was an i7 8650, same as the Latitude. 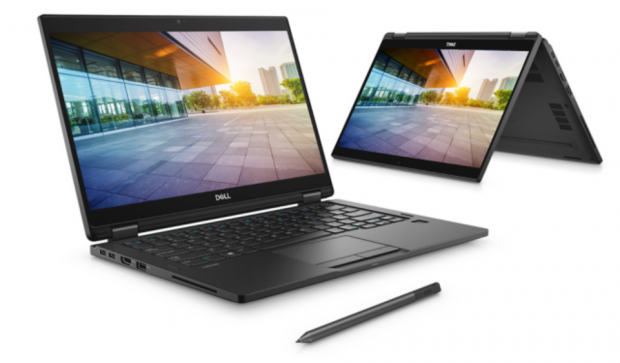 The Dell Latitude 7390 2-in-1 is possibly the best system we have seen for the road warrior, and designer. 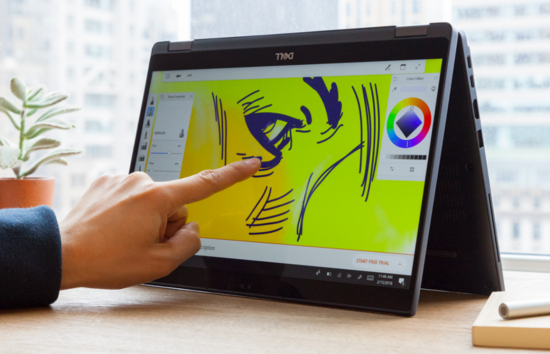 The active pen, high-performance processor, and non-glare HD screen are ideal. The price is in line and competitive with other machines.